This Watch has Fixed Ceramic bezel with Skeleton dial and Gold-tone hands. The watch performs following functions: chronograph, date, hours, minutes and seconds. The watch has Black Rubber strap with a hidden Fold Over Buckle. Sapphire crystal protects only front side of this watch. Case back is Transparent. Automatic movement. Power reserve 72 hours. This model is water-resistant up to 100m/330ft . 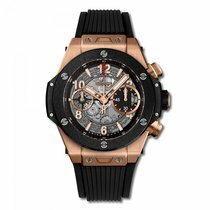 The watch comes with 45 mm Rose Gold case.